Thanks to our SunPower Community, we have reached our goal! We received inspiring photos and videos from around the world on how the sun fuels everyone’s lives. We are so grateful for the passionate participation and support of this campaign. As a huge thank you to our community, we have put together a video of some of the best and most interesting ways you all #ShareOurSun to power your lives. Keep your eyes open! You may see your entry. Because we’ve reached our goal, we’re able to share the power of the sun with 7,200 members of the Arhuaco tribe in Sabana Crespo, a village in Colombia’s Sierra Nevada Mountains. Thank you! We’ve partnered with the Solar Electric Light Fund (SELF), a non-profit organization established in 1990 that promotes, develops and facilitates solar rural electrification and energy self-sufficiency in developing countries. Clean energy for their medical clinic, microenterprise center, general store and school. Training for members of the tribe who will be maintaining their solar installation. 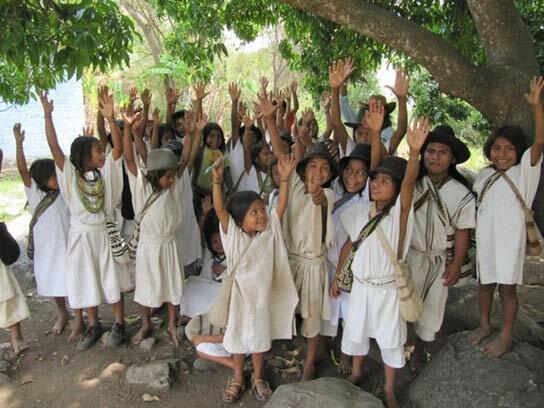 The Arhuaco people, or “Elder Brothers”, have a message for us who live in the industrialized world, otherwise known as their “Younger Brothers”. From their vantage point in the hills of Sabana Crespo, they can see the destruction of the Earth, causing an ecological imbalance that will affect the future for all inhabitants. They say that our actions of exploitation, devastation and plundering for resources is weakening "The Great Mother" and leading to our destruction. With this project, they intend to set an example of how anyone can utilize clean solar energy without negatively impacting the environment. Thank you for being a part of our SunPower Community and for sharing our sun!